Deepika, a four-time World Cup final silver medallist, qualified for the Archery World Cup Final in Samsun, Turkey, which will be her seventh appearance at the season-ending event. 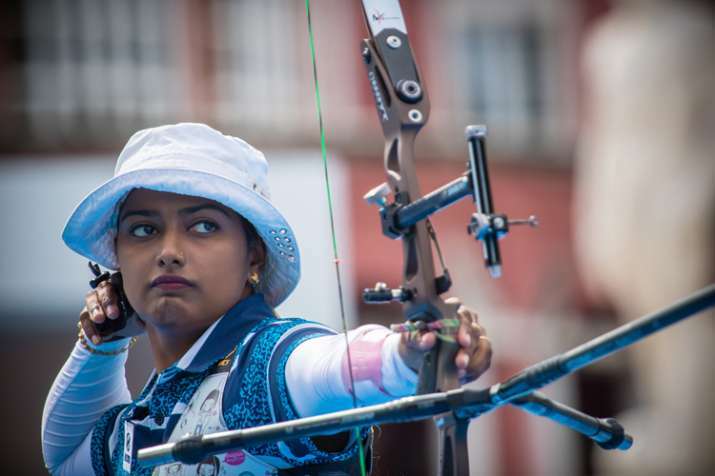 Ace India archer Deepika Kumari shrugged off her inferior run of form by clinching the gold medal in the women's recurve event at the World Cup (Stage III), beating Germany's Michelle Kroppen by 7-3 to qualify for the circuit Final, scheduled later this year. "Finally!. That's what I said when I won this gold medal," said Deepika, whose last victory at a World Cup stage event came six years ago, in Antalya back in 2012. The ace Indian archer opened the match with 29 out of a 30 possible points to take a 2-0 lead, before splitting the points with kroppen in the second. The German archer, making her individual debut in the finals arena, won the third set and tied the match at 3-3. Deepika then took the fourth and fifth sets with a 29 and a 27, over Michelle's pair of 26s, to win the match, 7-3. "I was repeating to myself, just do it the best, this is your time; just enjoy your game and forget about winning or losing and have fun," Deepika told the official website of World Archery Federation. "Do I feel relieved to qualify? Yes and no. I'm not expecting anything, at the moment I'm just enjoying my game, I want to enjoy my game," said Deepika, who has often failed to live up to expectations at the biggest stage like the Olympics. Meanwhile, Tan Ya-Ting of Chinese Taipei beat Gabriela Bayardo of the Netherlands in four sets, 7-1, to the recurve women's bronze medal.